This page will help the reader understand how RF devices tighten skin, the problem with most devices, and why the Infini by Lutronic is a game changer in this group. 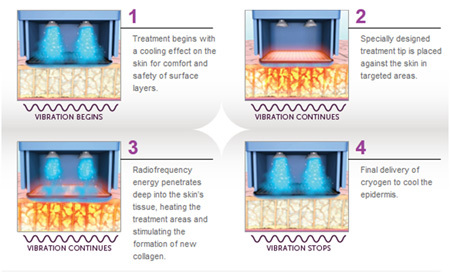 Research has shown that heating the dermis to a certain temperature will cause collagen stimulation and contraction. By heating to 40-45 degrees Celsius, enough heat is created to cause the body to try to repair the area by laying down new collagen. Higher temperatures, in the 65 degree range, will denature collagen and cause contraction. Obviously this requires more energy but this equates to more visible results. Here’s the problem with all cutaneous devices (Exilis, Venus Freeze, Pelleve, Viora Reaction, 3Deep RF, Accent XL, eMatrix, eTwo, TriPolar RF, ReFirm, Sublime, ePrime): It is very difficult to heat the dermis to a temperature that is effective and still maintain safe temperatures for the skin surface. If the surface were to reach the 40-45 degree area, it would burn. So, these device’s solution has been to try to cool the surface while pumping in energy to the deeper layers. This becomes a very difficult and unpredictable task. The devices rely on the tissues to carry the energy to the right level. Differences in skin thickness, hydration and the composition of collagen and fat can lead to placement of the energy at unknown or variable depths. If the energy is placed too deep, you can get fat necrosis, as what was occurring with the early Thermage device, and if placed too superficial, the skin skin can burn or get hyperpigmentation. Also, if you don’t actually reach the critical temperatures, you will get no stimulation of collagen. Multiple treatments are the norm for several of these devices because getting collagen stimulation is very difficult with the one treatment. The bottom line is that ALL CUTANEOUS RF DEVICES, NO MATTER WHAT THEY ARE CALLED, HAVE THE PROBLEM WITH UNPREDICTABLE HEATING OF THE DERMIS AND THEREFORE UNPREDICTABLE RESULTS. Ever since Fraxel was approved in 2005, the concept of treating areas fractionally has been the desired treatment modality for most devices. By treating only a fraction of the tissue, you can have more safety, more comfort, yet still get fairly similar results than treating the entire area. This concept has been borne out mainly with lasers in the arena of fractional laser resurfacing. Now comes another “knock” for the majority of RF devices: Almost all of the devices use a bulk heating method and not a fractional heating, so the risk, downtime, and discomfort are high. By keeping surrounding tissues untreated as with the Infini, you get faster healing, less pain, and much less risk. So how can we get more predictability with RF? Penetrate the skin to the level you would like to heat with microneedles and bypass the superficial layer that must stay cool and untreated. You can heat the deeper tissues to a much higher level with this technique, leading to greater collagen remodeling, collagen contraction, and stimulation. As a secondary benefit, the actual penetration with microneedles has been shown to mechanically stimulate fibroblasts to produce collagen. There currently are many popular treatments based solely on microneedling (Vampire Microneedling). By creating an opening in the skin with the needles, topical therapeutics can be applied at the conclusion of the treatment which will get to levels much deeper than when typically applied to the surface of the skin. These can include: growth factors (rejuvenation), Vitamin C (for collagen), hydroquinones (for pigment), Retin A (rejuvenation and acne). Going deeper into the skin allows for some treatment opportunities which haven’t been/or poorly been addressed in the past with RF devices: Acne treatment (attacking the sebaceous glands), acne or other scarring (particularly darker skin types), and sweating (attacking the sweat glands). Evolastin: Uses 32g needles (fairly large) in depths which are between 1-2mm. The needles enter the skin in a tangential manner, so the exact depth is hard to predict. The energy transmits between paired needles, so the heating in fractional and localized. The major problem is that the patient requires tumescent anesthesia (infiltrating lidocaine mixed with saline) into the area being treated. This adds additional time, discomfort, and risk. Another concern is that this solution actually changes the tissue characteristics, so the treatment becomes less predictable – maybe more or less effective in different areas or maybe safety concerns in certain areas. Fractora: Uses needles which have a fixed depth of 1mm. The energy is transmitted through the needles and circles back to the electrode sitting of the surface of the skin. 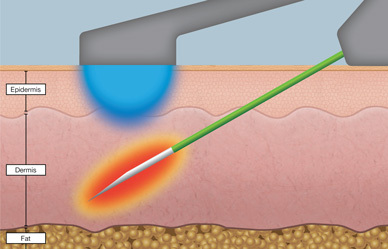 The surface probe has a sensor to monitor the skin temperature so as to maintain it within safe parameters. This is truly NOT fractional because the energy is dispersed in the areas between the needle tips and the skin surface. Here we go again with unpredictable traveling of the energy through the tissues and bulk heating. Concerns for safety and discomfort come to mind. Treating scars of all types but particularly acne scars. It has a great advantage over laser for darker skin types. Infini might turn out to be the “go to” device for scars over the Fraxel Dual 1550 because of deeper treatment levels (3.5mm vs 1.8mm of the Fraxel) and without the pigmentation risks. Tightening loose skin on all parts of the body including: arms, chest, knees, abdomen. There are no limitations as to where the skin can treated on the body. No exclusion of patients based on skin type with no risk of hyperpigmentation. To summarize, RF skin tightening has over a 10 year history which has been fraught with several different technical hurdles: unpredictable results, discomfort, and safety concerns. Using microneedling RF, we can get the energy down to the level needed with more accuracy and more safety. Infini seems to have the right combination of the transmission of energy through their needle tips as well as having variable depths to be the ideal RF Skin Tightener at the present time. It also has a broad list of indications including acne scars, skin tightening on the body, and improving the fine lines and wrinkles of facial skin.